An artist’s rendering of a recently discovered gigantic, quadrupedal dinosaur foraging in the early Jurassic of South Africa. Sauropods, including well-known genera, such as Brontosaurus and Apatosaurus, were the biggest land animals to have ever lived, with body masses topping thirty-five metric tons. 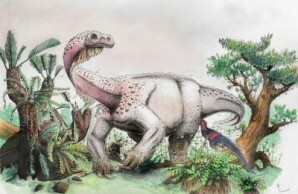 A newly discovered sauropodomorph dinosaur species that lived 200 million years ago, well before its sauropod relatives reached their dominance, has offered fresh insight into how sauropods evolved their massive size. 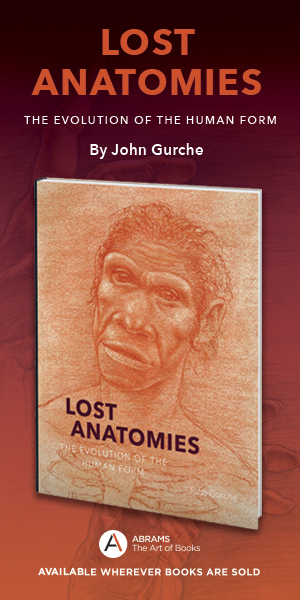 Researchers led by senior author Jonah Choiniere, a paleontologist at the University of the Witwatersrand in South Africa, named their discovery Ledumahadi mafube, meaning “a giant thunderclap at dawn” in Sesotho, the indigenous language of the region of South Africa where its bones were found. L. mafube was likely the largest animal on Earth in its time, weighing in at twelve metric tons and reaching four meters tall at the hips. To determine how L. mafube moved, the research team developed a new method of comparing the girths of dinosaur limbs. Because weight-bearing bone grows thicker, similar thicknesses in the front and rear limb bones strongly point to all four appendages being used for walking, indicating that the animal is quadrupedal. Conversely, significantly thinner front limbs are more likely to have served as arms, thus indicating that the animal is bipedal. Choiniere and colleagues validated their method by accurately predicting quadrupedalism versus bipedalism in living species. Analysis of L. mafube’s limb bones showed that it stood out from its bipedal contemporaries by being quadrupedal. But while its sauropod descendants had rigid, column-like legs to support their massive weight, similar to those of modern-day elephants, L. mafube had thick limbs that flexed. Combined with findings of other early dinosaurs having developed degrees of quadrupedal traits, the study of L. mafube suggests that four-limbed postures evolved at least twice, and earlier than previously thought in dinosaur lineage. A rich range of limb shapes and sizes ultimately led to the sauropods’ highly successful, column-legged adaptation. “There was evolutionary ‘experimentation’ with walking on all fours before true sauropods evolved,” said Choiniere.